Multi-day trips with your dog can be lots of fun, and the new Ruffwear Palisade dog pack helps to make it a practical solution. 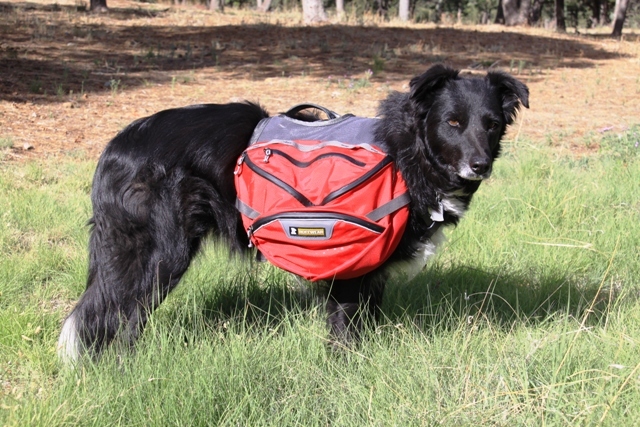 We reviewed the Palisade pack on a sturdy mid-sized (55 pound) Border Collie named Annie. Border Collies are working dogs, and they feel left out if they can’t pull their own weight whether the activity is herding cattle or flinging their four paws down a mountain trail. You’ve got to keep them busy. This Palisade pack immediately gave Annie a job to do, and she took to it pretty quick. With a 22-percent weight reduction, the Palisade dog pack continues to enjoy many of the same best-practice construction features you will find in high quality backpacks for humans. Ruffwear retained its proven and refined Web Master Harness chassis for this new generation Palisades pack that retails for about $129.00. When you consider a pack like this can last the life of your best canine friend, the Palisade pack offers the value you would expect from a well designed piece of hiking gear. You have five adjustment points to fit the Palisades pack to your dog. Fitting the Palisade pack is very straight forward, and it didn’t take long for Annie to get comfortable slipping one athletic leg through the harness, while the other harness straps simply clip in just like your human backpack C-clips. Another excellent feature is the ability to detach the saddlebags completely while fitting the dog into the harness. And on the trail, you can remove the saddlebags for trail breaks, climbing steep trail sections, or water crossings. Saddlebags have a main cargo pocket and two smaller pockets. outside pocket containing a compression strap to snug down the load. 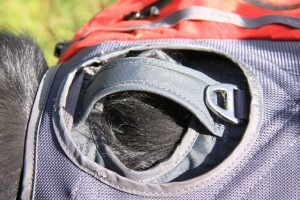 Top pockets are shallow enough for quick access to dog-snacks, a rolled up leash, or any small accessory items. The large cargo pockets have interior pocket sleeves to store the one-liter water bladders and keep them from jangling or sloshing with other gear. It is very astute to include compression straps to secure the gear/food/water in each saddle bag. This third pocket is also useful for storing little plastic dog-poop bags. Three pockets for each saddlebag helps you get accustomed to what gear is in which pocket, which helps you keep the load balanced and organized. All zippers are coated similar to seam welding on high-end backpacks and wind parkas which really comes in handy for keeping water out of the dog food when you get stuck in an afternoon thundershower that lasts for two minutes. You’ll also notice covered vents at the bottom of each of the large cargo pockets to allow the pockets to breath and keep moisture from building up. A strip of webbing across each saddle bag serves as additional lash points built into the Palisade pack for any purpose you might have for them. When it gets dark outside and you are still on the trail, you will appreciate the reflective trim that illuminates your dog’s position in the beam of a headlamp or flash light. Assist handle and V-ring leash attachment point are strong and helpful. A V-ring leash attachment point at the top of the pack is a stout anchor for those times when you leash up your dog for road crossings, meeting pack-horses on the trail, or other humans with dogs. We valued having a luggage-type grab handle securely positioned on the top-center of the Palisade pack harness to help the dog over obstacles like fallen trees or climbing up out of a stream crossing. We found it helpful to go for several short hikes with just the two one-liter hydration bottles (included with the pack) filled with water to get Annie accustomed to having weight on her back. During these training hikes we noticed how centered the Palisades pack stayed on Annie’s back. There was very little side-to-side travel of the pack other than the natural rolling of the dog’s shoulders. The packs weight was well distributed across the shoulders and along the forward part of the dog’s back. We didn’t experience any instance of the dog fighting the bulk or weight of the pack. There was never a time when Annie laid down and said, “I’m not doing this anymore.” She seemed to adapt very nicely. And a lot of that had to do with getting her used to having the pack on in incremental steps. It was a good sign to see that Annie didn’t fight the pack. And once we knew we had the proper strap adjustments, she took to dog-packing as just another type of responsibility. The saddlebags offer enough room to stash, not only the hydration bladders (one in each saddle bag), but additional one-liter aluminum water bottles laying flat in the saddlebags, enough food pouches for a couple days, and her Sierra Cup for drinking and eating. The Palisades pack load varied from day hikes, with just water, to overnighters where additional water and food rounded out the pack load. On longer trips, I would still carry extra food for Annie and share my water supply until we could fill up at a water source. If your dog is a youngster, you can let the dog carry a little more weight than I allowed Annie to shoulder. Annie is eight-years-old, and I’m amazed at her strength and energy. But I am also aware her heart is bigger than she is. I also found warm weather is much less desirable for dog-packing than cooler weather. So weather becomes a factor now when I decide how much weight Annie will carry and how long a trip we’re going to take with her carrying her own backpack. These are some of the things you will have to determine for your own dog. 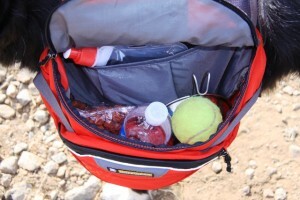 But the primary thing we enjoyed about the Ruffwear Palisade pack was that it fit so well, and is extremely well made.